Although the circumstances surrounding a death are difficult to handle at any age, adolescence brings with it challenges and struggles that until now have been largely overlooked. 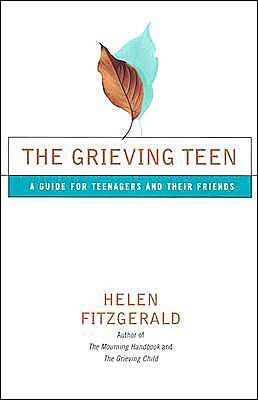 But in this unique and compassionate guide, renowned grief counselor Helen Fitzgerald turns her attention to the special needs of adolescents struggling with loss and gives them the tools they need to work through their pain and grief. Writing not only about but also for teenagers, Fitzgerald adeptly covers the entire range of situations in which teens may find themselves grieving a death, whether the cause was old age, terminal illness, school violence, or suicide. She helps teens address the gamut of strong and difficult emotions they will experience and the new situations they will face, including family changes, issues with friends, problems at school, and the courage needed to move forward with one’s own life. Using the clear and accessible format that has made “The Mourning Handbook” and “The Grieving Child” enduring and helpful classics, Fitzgerald guides teens through everything from the sickbed to the funeral, from the first day back at school to the first anniversary of the death. Above all, she lets teens know that even in their darkest hour, they are not alone.